"My heart and prayers go out to you all of my family during this difficult time!! Such an amazing woman gone, but will never be forgotten!!..." 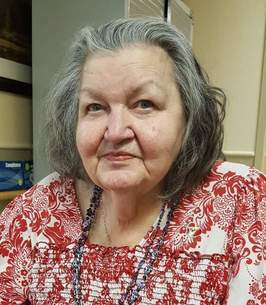 Alta M. Mullens, 81, Independence, formerly of Buckner, MO passed away Oct. 15, 2018. Visitation will be 2-4 pm, Sunday, Oct. 21 at Carson-Speaks Chapel. 1501 W. Lexington Ave., Independence, MO 64052. Graveside services will be 11:30 am, Monday, Oct. 22 at Oakland Cemetery. In lieu of flowers the family requests contributions to the Alzheimer’s Association of Greater Kansas City, 4126, 3846 W 75th St, Prairie Village, KS 66208. Alta was born on Dec. 24, 1936 in New Castle, IN and grew up there. She was the youngest of five children. She enjoyed oil painting, ceramics, her pet birds and was an animal lover. She was very involved in her neighborhood in Buckner. Alta was preceded in death by daughters Linda Carter, Tracey Avgerinos, son Frank Simpson, siblings Ernie, Johnny, Mary and Clara. She is survived by sons Ed Simpson and wife Kay, Nashville, TN; Kevin Simpson and wife Doris; Rob Simpson and wife Lorie; Travis Simpson and wife Cheryl, all of Independence, MO; thirteen grandchildren and eighteen great-grandchildren. To plant a tree in memory of Alta Mae Mullens (Wisehart), please visit our Heartfelt Sympathies Store. We encourage you to share any memorable photos or stories about Alta. All tributes placed on and purchased through this memorial website will remain on in perpetuity for future generations. My heart and prayers go out to you all of my family during this difficult time!! Such an amazing woman gone, but will never be forgotten!! May she rest in peace! I love you Aunt Alta.